A white-striped golden Super Leaf. 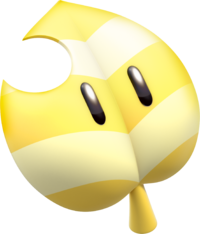 The Invincibility Leaf (also called Invincible Super Leaf or Gold Leaf) is a power-up that first appeared in Super Mario 3D Land. This power-up is very similar to the Super Leaf, but with added invincibility. In Super Mario 3D Land, its Assist Block only appears after Mario or Luigi loses five lives in a (skipped) normal world level (for example, by using a Warp Zone); it doesn't appear in the Special Worlds nor reappear in already cleared levels. Using the leaf will turn Mario into White Tanooki Mario, making him invincible for the entire level (though he can't get extra lives). After completing a level with it, the player will revert back to the normal Tanooki form. The Invincibility Leaf returns in New Super Mario Bros. 2, but changes Mario into White Raccoon Mario instead of White Tanooki Mario. As White Raccoon Mario, the Power Meter fills up faster than as normal Raccoon Mario, and Mario has the ability to walk/run on water, like Mini Mario. The power-up will last for the entire level and will revert to normal Raccoon Mario/Luigi upon completion. White Raccoon Mario cannot be replaced by any other powered-up form, including Gold Mario and Mega Mario. However, Super Stars can still be used while the Invincibility Leaf is in effect. To obtain the secret exits and unlock hidden levels, the player must clear the level without using the Invincibility Leaf. It can also be used in Coin Rush mode, where Mario remains in White Raccoon form for the entire pack. As with Super Mario 3D Land, its Assist Block only appears after Mario loses five consecutive lives in any given level, with the exception of the Cannon levels. However, the block will remain in the level until the player beats it without using it and it can return in a level, even if the level in question has been cleared. The Invincibility Leaf also appears in Super Mario 3D World, referred to as the Invincible Super Leaf on the website, as well as the Gold Leaf in the Prima game guide. It again turns players into the White Tanooki form. The Assist Block functions as it did in New Super Mario Bros. 2, but the number of lost lives needed to make it appear is based on the number of players: 6 for one player, 12 for two, 18 for three, and 24 for four. Dutch Onoverwinnelijkheidsblaadje Unconquerability Leaf. The suffix -je denotes a diminutive. This page was last edited on September 22, 2018, at 14:19.